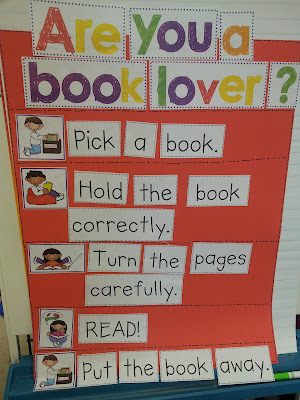 In preparation for starting to build stamina next week I wanted to make sure my students had a clear understanding of the three ways to read a book and how to take care of the books in their book box. 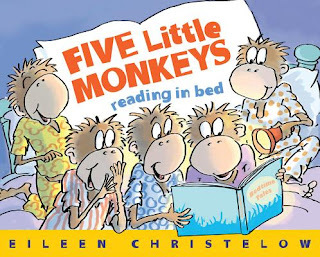 Over the course of the last several days I read and reread several books to my class. After the second read we practiced retelling the story because we already knew it and used the pictures to help us. I held the book up and turned the pages one at a time while I called on different students to retell what happened on each page. When needed I provided students with prompts and asked questions to help get them thinking about what happened. These two books were favorites this week. 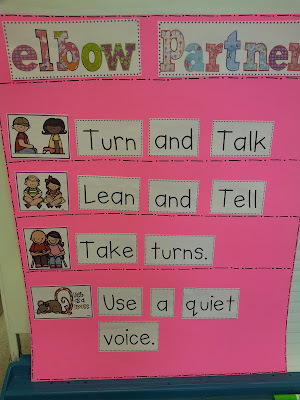 We practiced how to "lean and tell" and "turn and talk" with our elbow partners. When I want students to share a one or two word response I have them lean and tell. When I want them to share something more then that I have them turn and talk. Our anchor chart came from Kim Adsit's Blasting Off With Reader's Workshop unit. 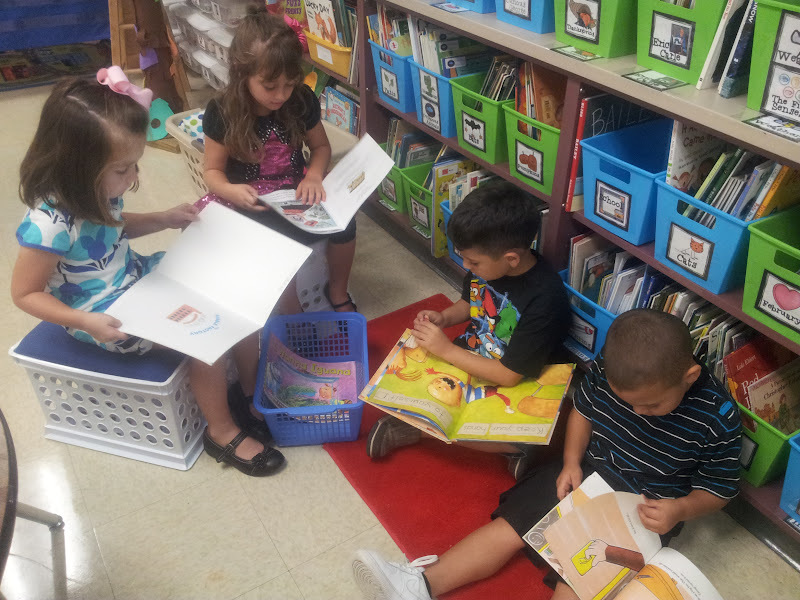 We practiced reading then putting our books back in the basket and returning to the carpet when we heard the chime. I had to be secretly excited about the students who ignored the chime because they did not want to stop reading their books :) For more information on what the sisters say about signaling click here. 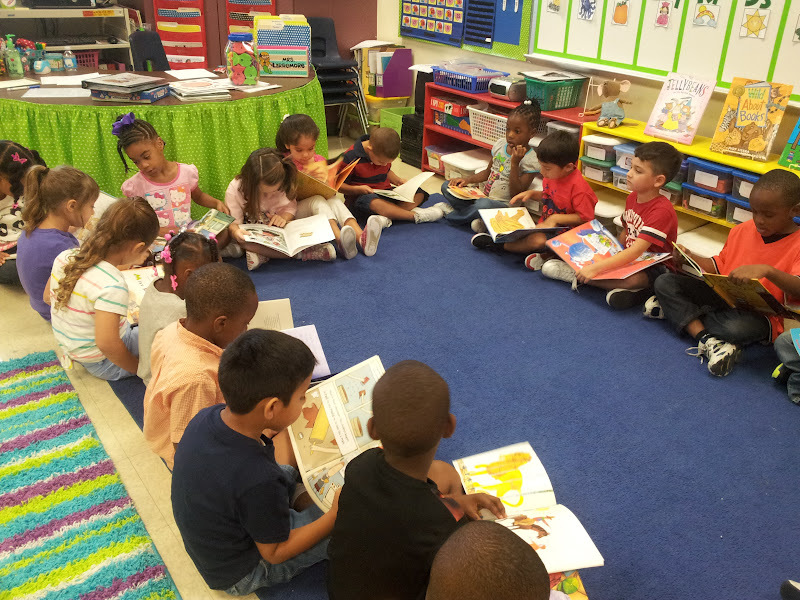 We learned how to hold books correctly, turn the pages carefully, and put our books away. We also learned about the book hospital and when we need to put books in it. First we learned about taking care of books. Then we made an anchor chart to help us remember what we talked about (this anchor chart came from Blasting Off With Reader's Workshop). I demonstrated the right way and the wrong way to hold a book and turn the pages. I had students give me a thumbs up when I did it correctly and a thumbs down when I did it incorrectly (this idea came from Blasting off with Reader's Workshop). 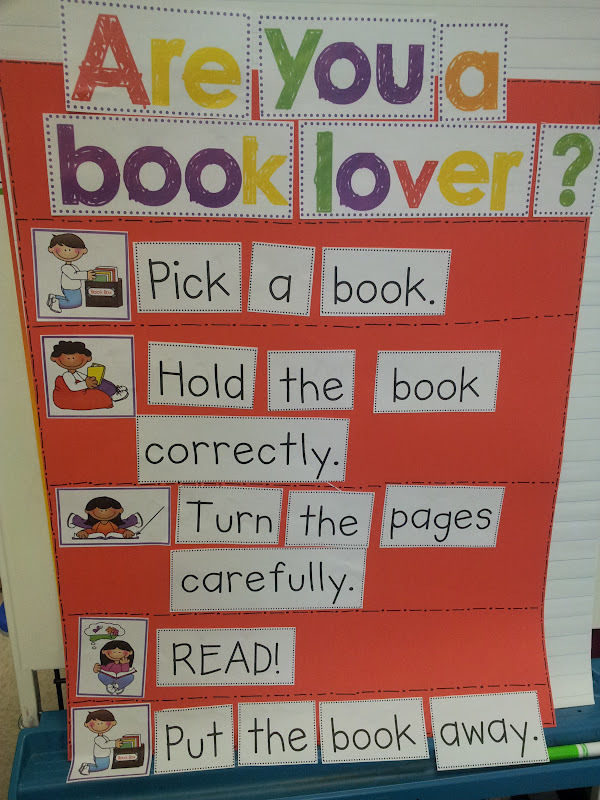 Then we practiced holding books correctly and turning the pages carefully. 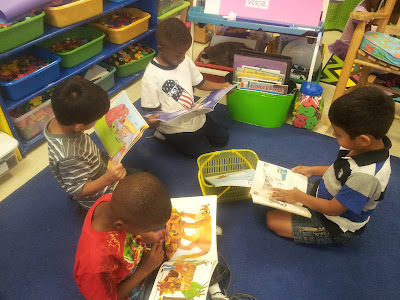 We spent two days learning how to take care of books and practicing in small groups. 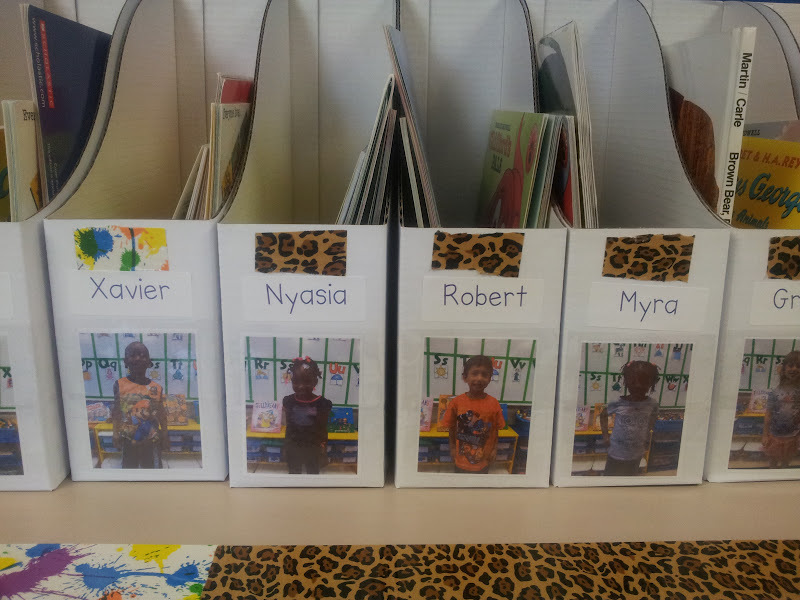 I grouped students by their table color and put them in various places around the room. 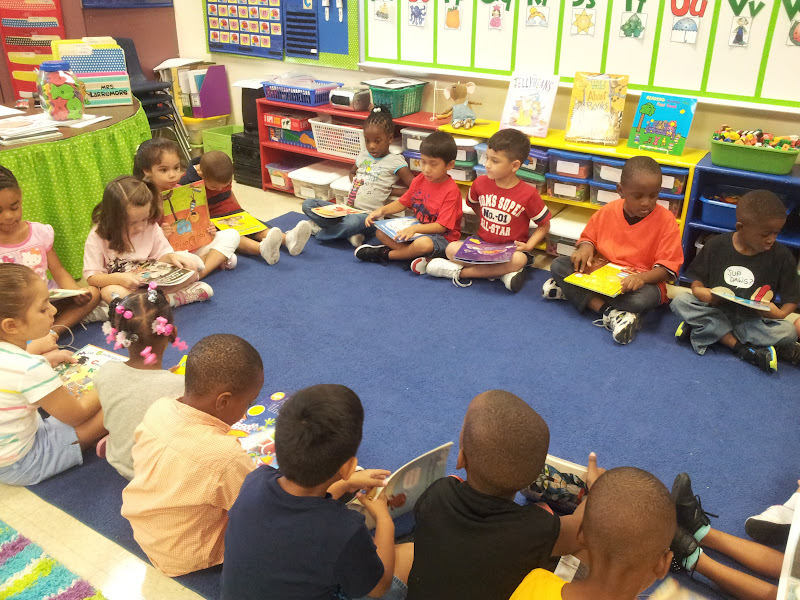 Then I gave each group a basket of books to practice with. 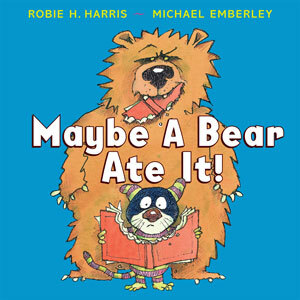 I used the book Maybe a Bear Ate It! to talk about how to take care of our books. The different pages in the book were a great springboard for talking about how we do not sit on our books, we do not put them in our mouth, we do not lay them all over the floor because they may get stepped on, and we do not put food and drinks around them. 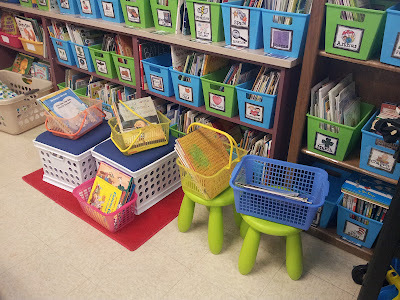 I placed familiar stories and books we read this week in the baskets. I wanted to make sure students could practice reading a book by retelling a story they already knew. 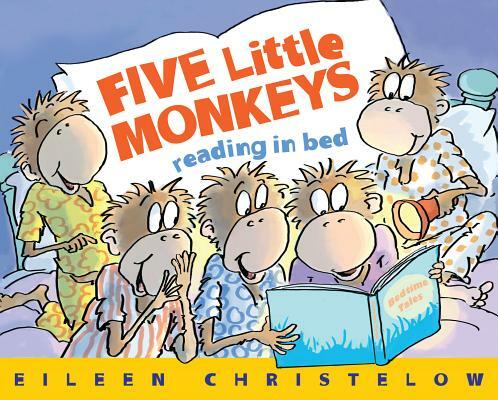 I also put books about popular characters in the basket- Froggy, Clifford, Curious George, etc. I got their book boxes ready for next week. I am starting with three books per student. To get started I chose three "look" books for each student. Once again I used familiar reads, fairy tales, popular characters, and books we read this week. 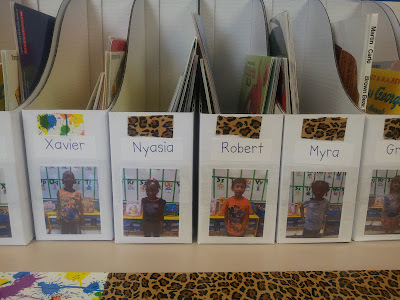 My hope is that by spending so much time now modeling and practicing the three ways to read a book and how to take care of books we will be able to build stamina smoother and faster. I definitely have to check out Maybe A Bear Ate It. 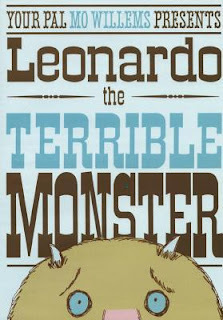 Seems like it is such a cute book! I love that you had them practice in the large group as you modeled and in small groups! I'm going to add the large group practice this year. Thanks for the tips. We talked about how to picture walk & read a book. I am going to build on the other ways next week. Thanks for the ideas on WHAT types of books to put in the baskets! I LOVE how you added their pictures! I look fwd to hearing how to goes for you! Thanks you so much for sharing. I am new to Daily 5 and would like to introduce it to my classroom this year. I look forward to more and more of your post about it, keep them coming! I thought I was ready to begin building stamina this week, but after reading your post, I decided to spend more time practicing. Thank you for the great ideas. Could you email the anchor charts? They are so cute and I would love to use them in my classroom. My anchor charts came from Kim Adsit's Blasting Off With Reader's Workshop unit. You can purchase the unit from TPT. Where did you find the clip art for are you a book lover?